Cessation of Picket Firing—Position of Beauregard’s Troops—Rebels Fortifying on the Chickahominy. HEAD-QUARTERS, ARMY OF THE POTOMAC, June 9, 1864.—There is nothing especially interesting to report on a part of the lines. Picket firing has been kept up all day, while at other portions it would seem, as if by mutual consent, this practice has ceased. 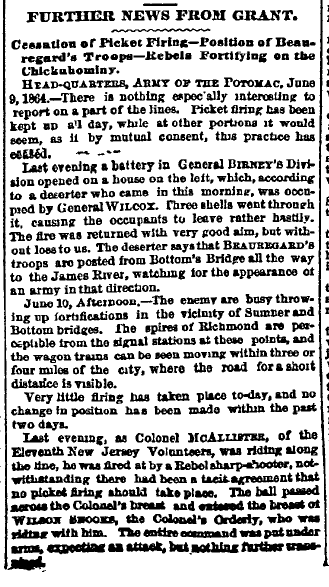 Last evening a battery in General BIRNEY’S Division opened on a house on the left, which, according to a deserter who came in this morning, was occupied by General WILCOX. Three shells went through it, causing the occupants to leave rather hastily. The fire was returned with very good aim, but without loss to us. The deserter says that BEAUREGARD’S troops are posted from Bottom’s Bridge all the way to the James River, watching for the appearance of any army in that direction. June 10, Afternoon.—The enemy are busy throwing up fortifications in the vicinity of Sumner and Bottom bridges. The spires of Richmond are perceptible from the signal stations at these points, and the wagon trains can be seen moving within three or four miles of the city, where the road for a short distance is visible. Very little firing has taken place to-day, and no change in position has been made within the past two days.